I am struck by both a sense of pride in our country and an overwhelming hope to do justice to this memorial. When I first heard about the tribute, I wasn't so sure it would have any real impact at all. And then I began to see the faces of those people whose names were on the September 11th Memorial list. By the time I signed up, and Amy's name was assigned to me, I was struck hard by the reality that lies within those photos. I could not go to bed at night and simply erase them from mind. Just seeing her photo, and that of her fiance's as well, struck home. I think it says a lot about the US that we are a country that will never back down in the face of evil. It is important that each person from 9/11 be remembered, for they were just like us. D. Challener Roe, who started this tribute, felt it equally important that every person who died that day in September be honored, and I would like to thank him for pushing this idea and coming through with 3412 bloggers strong. That is just amazing. Future generations must remember this day and these victims; and in that time when those of us are old or have passed on, they alone must remember a country that rallied in the face of tragedy and stood up against those who would try to bring us down in the name of evil. 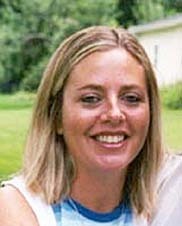 Today, I am honoring Amy R. King, 29, and her fiance, Michael C. Tarrou, 38. 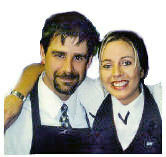 I was not assigned to write about Michael, but the two were a couple, both flight attendants on UA flight 175. This was the second plane to crash into the South tower of the World Trade Center on September 11th. I don't see how I can write about Amy without also writing about Michael. In my research, I found that they were soul-mates, they had planned a life together and that life was not to be. She was was the youngest of three sisters who grew up near Jamestown, NY. She loved to paint and she ran track and cross country in high school. She was especially known for her playful sense of humor and easy laugh. She met Michael at a work meeting two years before the crash, and the two had been inseparable ever since. They were not engaged at the time, but friends say it could have happened. They often arranged their flights together, and maybe it is comforting in some ways that they were together in the end. "They tried to get the same schedule so they could be together more," said Deborah Lloyd, Ms. King's sister, from her home in Naperville, Ill. "They were supposed to have a long layover in Chicago beginning Sept. 12. We were going to have dinner." Michael was a musician who wrote songs and played in bands in Queens and Long Island. His friend, Tom Divine, is quoted as saying "he was great at guitar, bass and keyboards and was pretty much the best vocalist I have ever worked with." Amy, from a musical family herself, had joined him in recording a backup of "I love you" on a recording of "Couch Potato," a song written and performed by Tarrou. Amy was close to her family. While based in Boston, she liked to visit her sister's family once a month. "She liked to imitate voices, children's voices. She was like a kid herself, " said Lloyd. She said it was clear that Tarrou was "the one" for her younger sister. They wanted to have children, she said, and King hoped they would all see the world together one day. 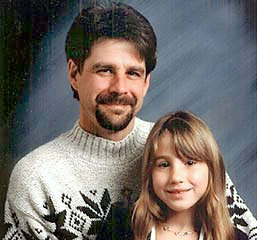 The two had had planned to move to Florida so Michael could be closer to his 11-year-old daughter, Gina. Working as a flight attendant, despite the odd schedules, permitted long weekends devoted to his 6th-grade daughter, who talks now about her father's humor, the dances he would do just for her and about his being in a better place. Gina remembers her father as a "jumpy, happy guy" who was always trying to cheer her up. And who was Amy? As I read through the guestbook on Legacy.com, I was warmed by the number of entries from family and friends who continue to write to her to this day. They talk of memories they shared and about their children who are growing up, of their impending weddings and of old friends that she had known in the past. When they mention family or friends who have passed on, they ask Amy to give that person a hug. A love like that, so strong... I almost felt as if I were intruding on this very personal part of their lives. I wanted to give you a sense of who she was, for she seemed to be so lively, engaging and incredible. This is a letter from her "best bud." "... it reminds us of the weekend you and Michael spent with us. We had so much fun that weekend! I will always cherish the memories we made that weekend! We have finally chosen a name for our baby boy. Michael Joseph will be his name. It only seems fitting. We were so fond of Mac and were looking forward to spending many more weekends with the two of you, especially the one where you tied the knot. I know you will be together forever so there is some comfort in that. Thanks for taking care of us and we miss you more than you'll ever know. We love you! Stacey, Aaron, and Sophie Dixson"
I will never think of 9/ll again without remembering Mac and Amy. I came to know them through these letters and photos, and my heart goes out to their family and friends. I can only imagine the two must be together right now, and it is my hope if their families ever come across this post...I can only wish you one thing after all these years, and that is to wish you peace. Dearest Amy, beloved aunt to three of my grandchildren, youngest child of our dear friends, first name in my email address book, great friend to my daughters and sons, treasured sister to Deb and Kellie and so much more. You were an angel in human form and a delight to be with and now you are an angel among the stars. Twinkle, sparkle and shine throughout eternity as you did through your brief but important life. 2,996 is a tribute to the victims of 9/11. On September 11, 2006, 2,996 volunteer bloggers will join together for a tribute to the victims of 9/11. Each person will pay a tribute to a single victim. We will honor them by remembering their lives. A wonderful tribute, Laura, to a beautiful woman and her soul-mate. How many family members and friends were touched by their lives, and then by their deaths. The ripple of a pond when a rock is thrown in tells the story. They wanted to be together - and now they are. Wow. Your tribute to them is amazing, you really got to know them both, and I can feel how you attached to them throughout your research. They were beautiful people. I hope their family and friends find your tribute, too. Lovely sentiments and a wonderful tribute to these people, Laura. You make this whole huge thing seem very personal. Wow! I've got the chills now and my heart is pounding and emotional. You did a great tribute for her and her fiance. It does make it feel a little better to know that they were together... for eternity. Your tribute brought tears to my eyes. It was lovely. I have one up, as well, if anyone wants to stop by. Laura, great job! I've read about a hundred 2996 memorials and they're all incredible in their own way. That complete strangers in this incredible country can come together and eulogize those who lost their lives at the hands of such monsters. I, for one, will never forget. I hope the people of our country will never forget. Thank you for doing this. It's so meaningful. each one of these moves me. Thank you for your tribute. What a terrible thing for their families and friends that they die on that horrible day. What a beautiful thing that they were able to be together. I'm sure they would have wanted it that way. Thanks for the obviously hard work you put into giving us such a beatiful memorial. Very beautiful post...Great job Laura. I didn't know any of the people who were killed that day, yet I feel like I knew every single one of them. Thank you all. This hard to write. I almost chickened out several times. Now, I'm glad I did. Your tribute is beautiful. I feel very sad for both of them, and for their families and friends. We lost so many beautiful souls that day. Thank you for sharing this with us. and, thank you for putting Amy and her fiance together in our memories. Please read my tribute to Major Dwayne Williams who was lost at the Pentagon. Thank you for not 'chickening out' on this. It's beautiful. What a beautiful young couple they were. That was a wonderful tribute. Thank you for writing it.